Today I made butter. Lots and lots of butter. And then I made compound butters. And then I ate butter. Sounds complicated (I mean, other than the eating part)? It’s not! 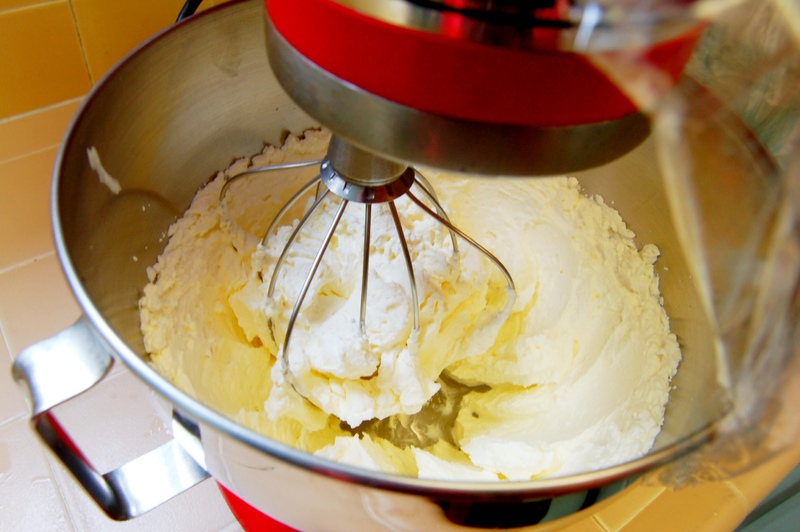 Butter and compound butters are so easy to make that I will never buy store bought again. Ok, maybe during the holidays when I’m making 7 dozen Linser Heart Cookies, but otherwise I’m making it myself. 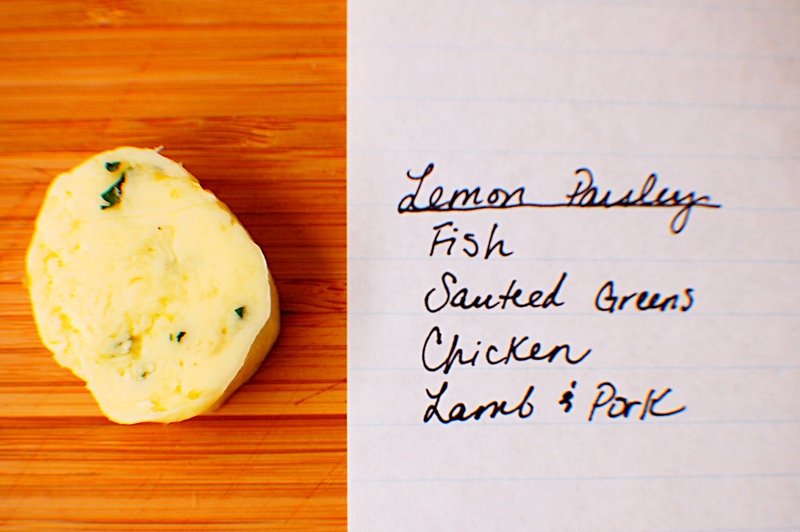 Homemade butter is so fresh, so creamy and compound butters add so much depth of flavor to any dish. Now, I can’t take credit for the actual butter recipe, which is from a recent Bon Appetit article. There is also an excellent article on homemade butters from http://www.thekitchn.com here that explains why/how you do everything to make your own butter. So while I do want to show you the process of making butter from cream and how to infuse cream, today’s post is primarily for compound butter. What is compound butter? It’s a really fancy name for “butter that has stuff in it”. And you can use it on anything. 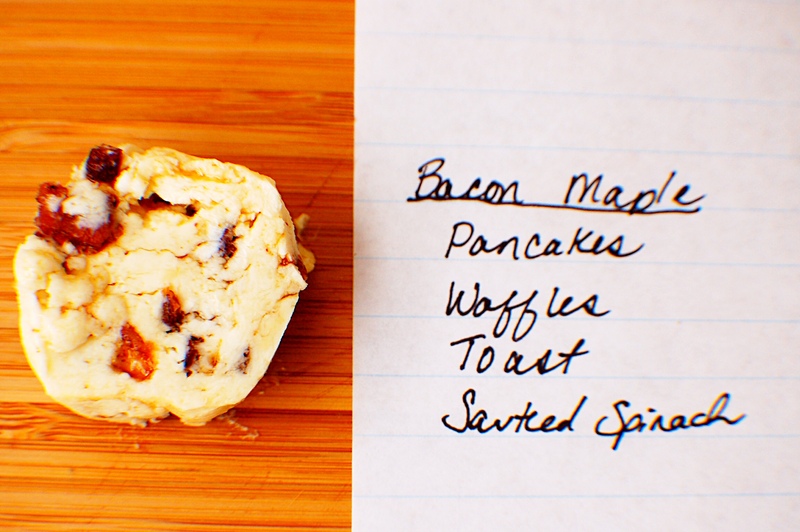 It’s kind of like bacon – it just makes everything better. I put sweet compound butters on toast, pancakes & sweet potatoes. Savory compound butters are fantastic for finishing meats (automatic sauce!) or on grilled bread. Below I’ve included a list of compound butters recipes as well as my suggestions for how to use them. But first, let’s make butter from scratch! 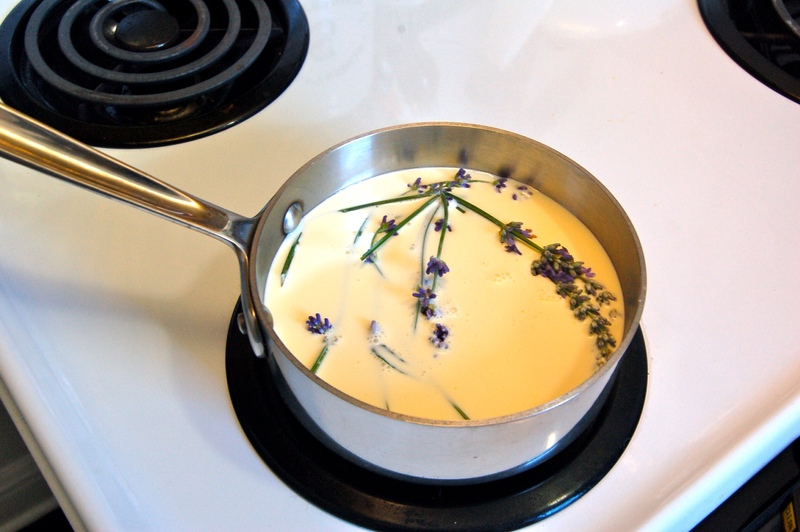 This recipe is to make Lavender, Honey & Sea Salt butter, but if you want to make original cream butter, simply (a) don’t infuse the cream with lavender and (b) don’t add honey. I mean, duh – right? Two things about making butter. One, use the BEST ingredients you can find. 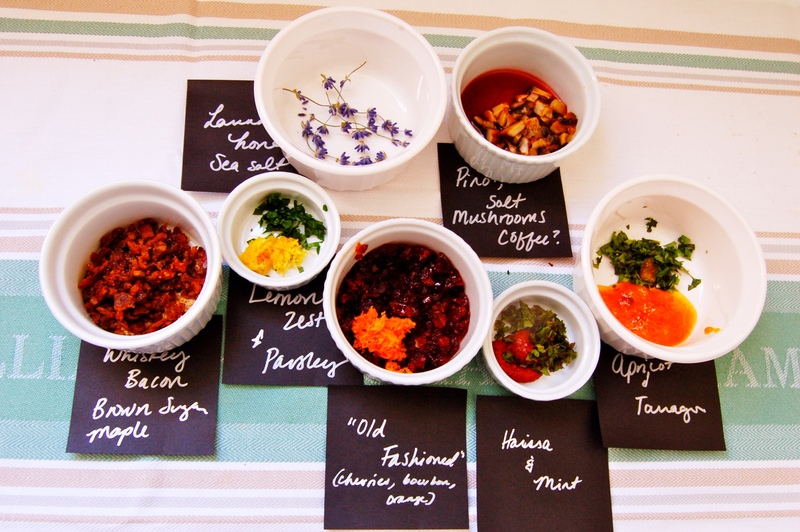 There are so few ingredients that every one matters! The cream is the main component, so spend the big bucks and your time to find the best available. If I could milk a cow myself for it, I would. But I don’t have a cow in my San Francisco apartment. Yet. Two, this recipe cultures the cream, which is a process of adding a cultured ingredient (it can be yogurt, creme fraiche, or in this case buttermilk). It sits for at least 12 hours on your counter, so plan accordingly. You can make the butter without the cultured ingredient and therefore not have it sit overnight, but it’s nowhere near as tasty! Thanks to Bon Appetit for printing the base butter recipe. 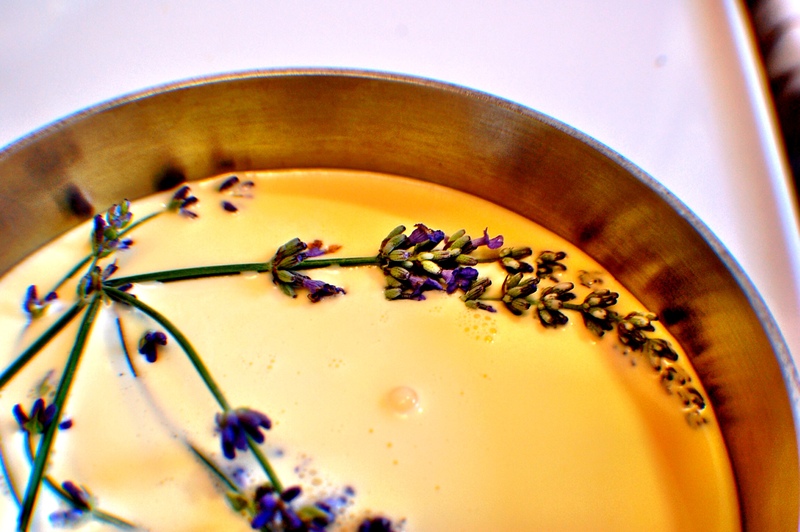 First, infuse the cream by GENTLY warming the cream with the lavender on LOW heat. Do not allow the cream to boil or separate, and if you see a film forming, remove from the heat. Infuse to taste. This takes about 20 minutes or until your friend, Rhianna, says “this tastes like body soap.” Let cool completely. 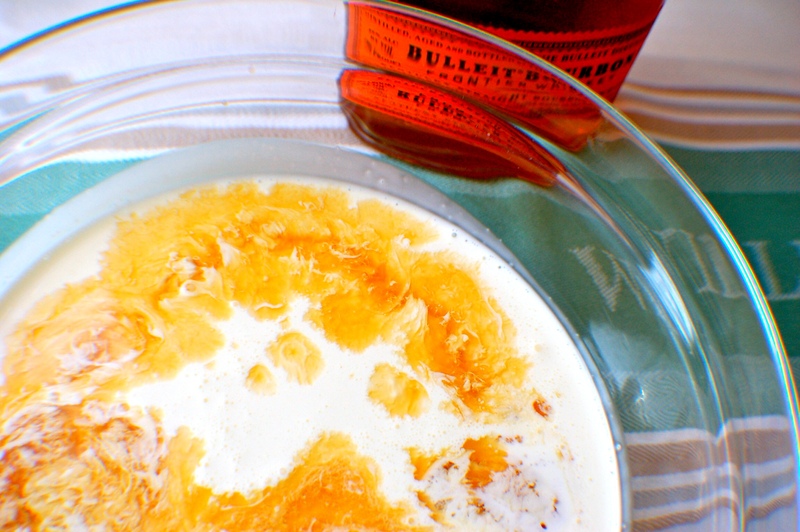 In a separate bowl, mix in the buttermilk and a few pinches of salt and cover. Let sit on your counter for 12 hours and up to 24 hours. The longer it stands, the “sharper” the taste will be. 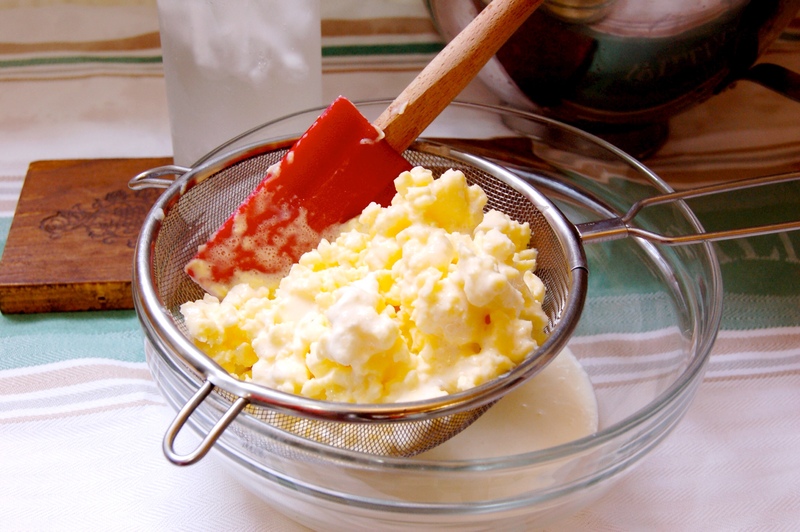 Once cultured and thickened, pour into a standing mixing bowl and place in fridge for 30 minutes. Allowing to cool assists in the separation of fats and liquids. Ok are you ready!? Because this is the fun part. 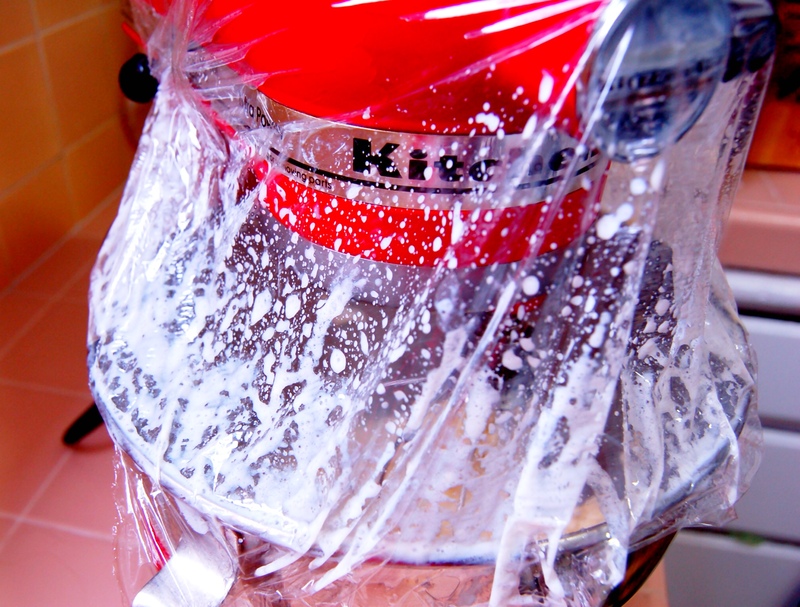 Set up your standing mixer with the beater attachment and cover with plastic cling wrap. Why? Because when the fats and liquids separate, the liquids will literally fly all over your kitchen. I know this because I’ve done it. Mix on HIGH for about 6-8 minutes until the butter clings to your beater and liquid flies all over the plastic wrap, NOT your kitchen. Wheeee! Liquid has separated and flung itself all over the plastic wrap! 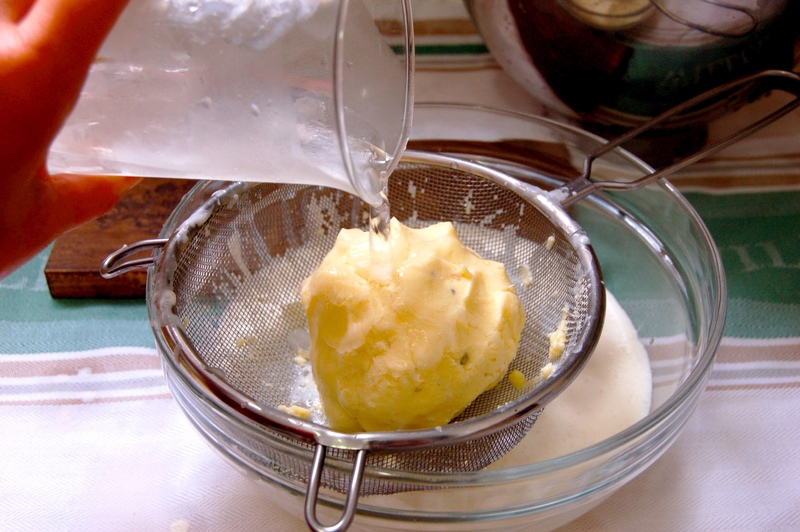 Place the butter in a strainer and begin to “wash” the butter. 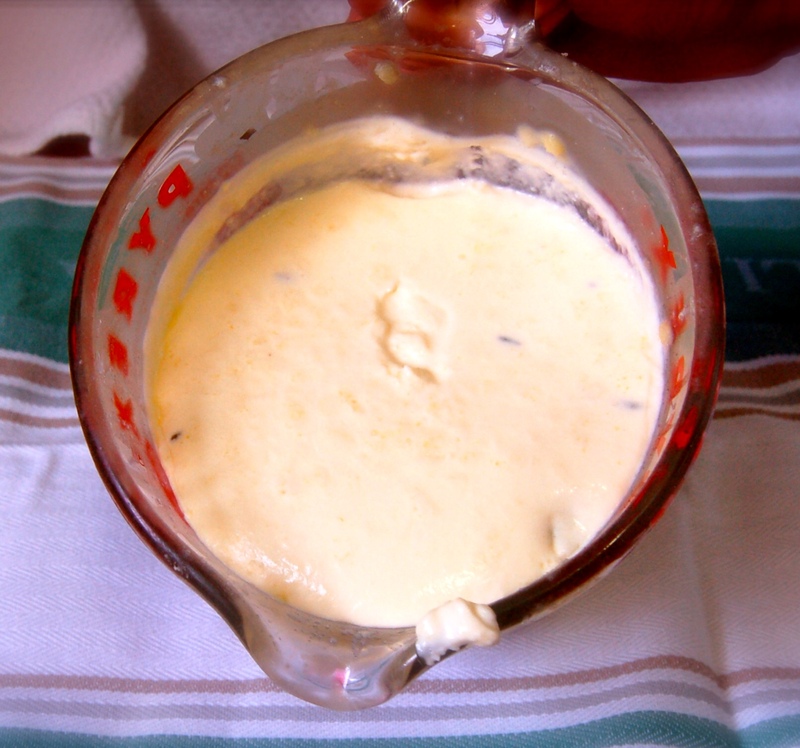 This process is pouring ice water over the butter and kneading it or smooshing with a spatula to separate the remaining buttermilk from the butter. 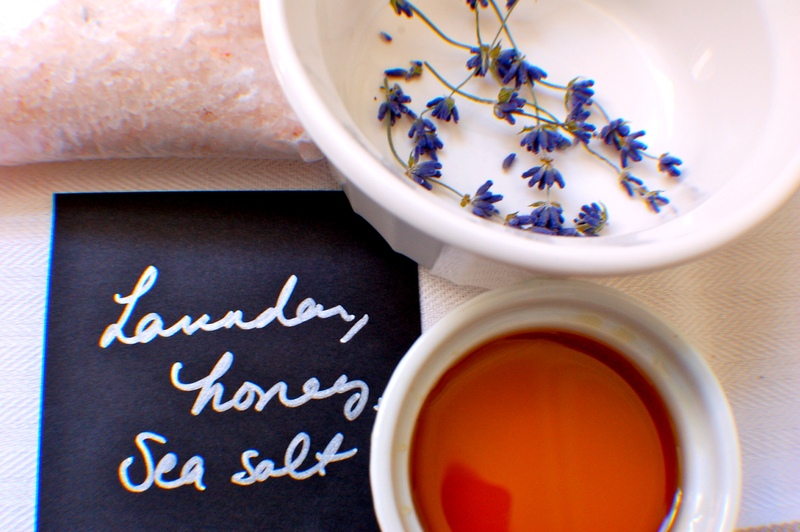 In a bowl, mix in the dried lavender, honey and salt to taste. Ta-da! 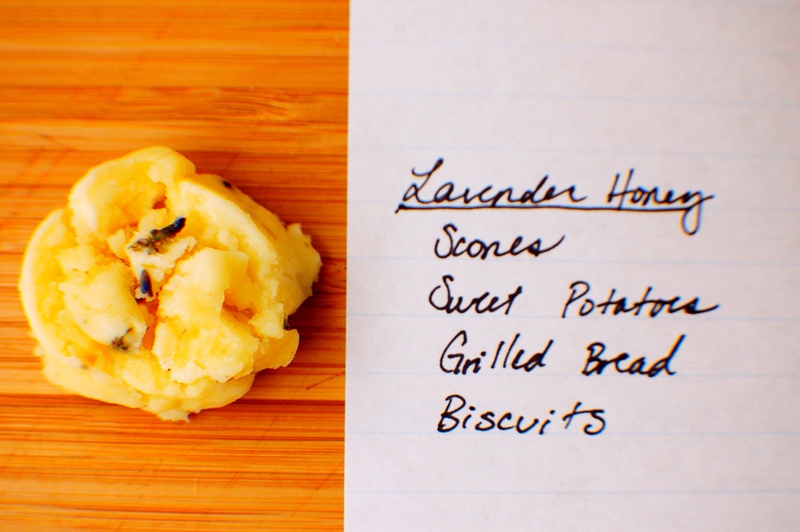 You have homemade lavender honey butter! Note: compound butter can be stored in parchment paper in the fridge for about a week or in parchment paper and a freezer bag in the freezer for about a month. 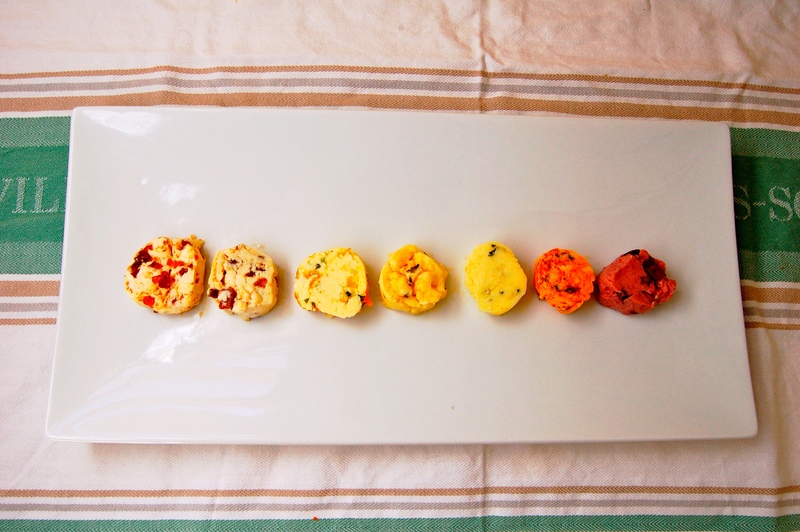 And now, for more compound butter recipes…. 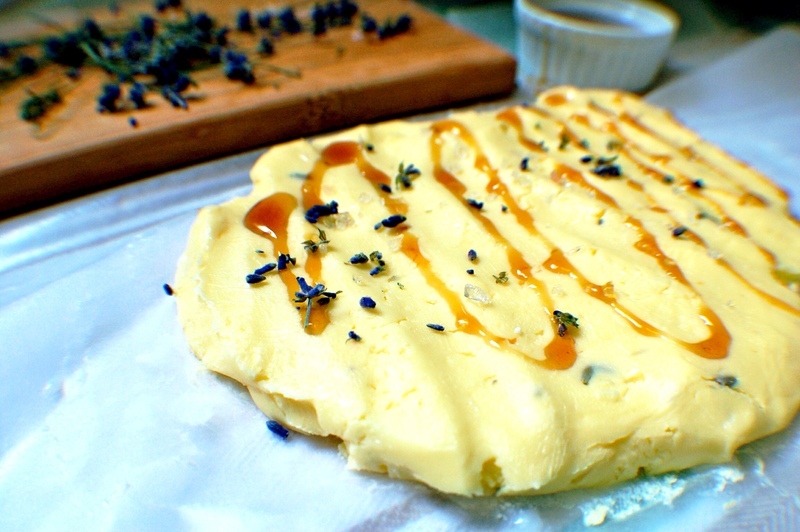 These recipes assume you’ve either bought your own store bought butter (gross) or you’ve made the above butter WITHOUT steeping with lavender and salt or you’ve made butter and altered the cream with bourbon per the below (mmmm bourbon). Uses: Finishing sauce for fish, lamb, pork, sauteed greens or chicken. No special preparation is required. 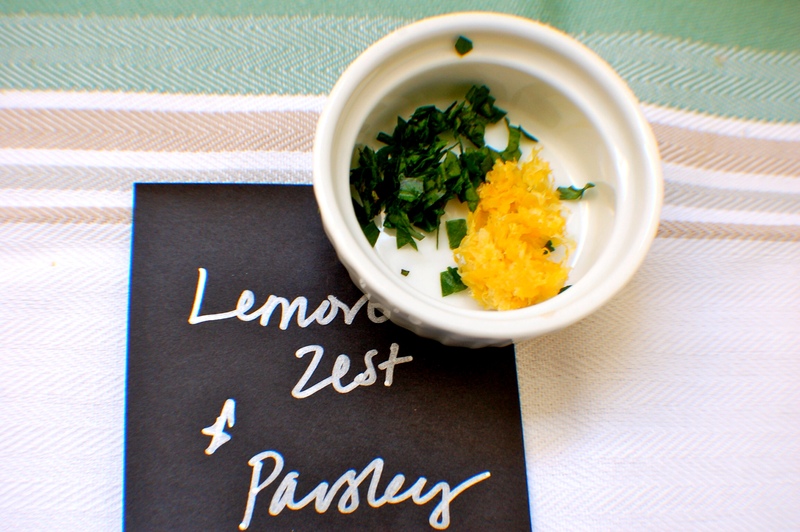 Simply zest lemon, mince parsley and mix in butter with sea salt. Uses: Finishing sauce for lamb, chicken, topping for glazed vegetables, on roasted potatoes, added to grilled bread with avocado. No special preparation is required. Zest lemon, mince mint, add in harissa and sea salt. 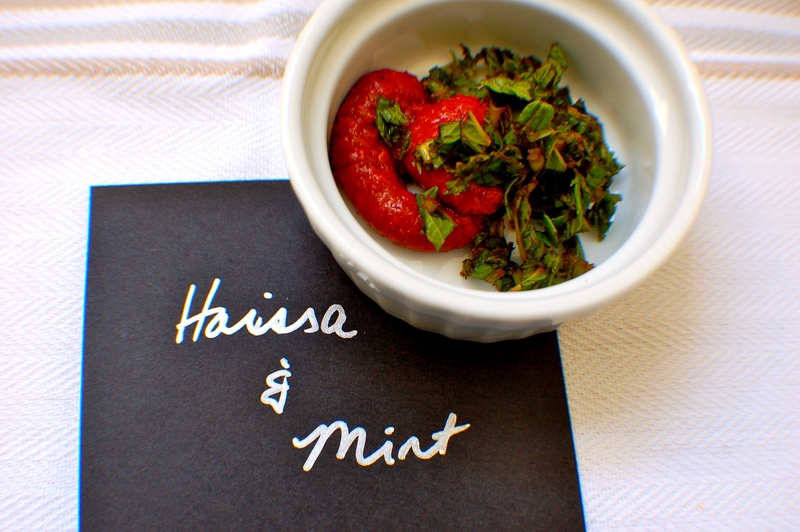 Harissa is very spicy, so add just a bit at a time. 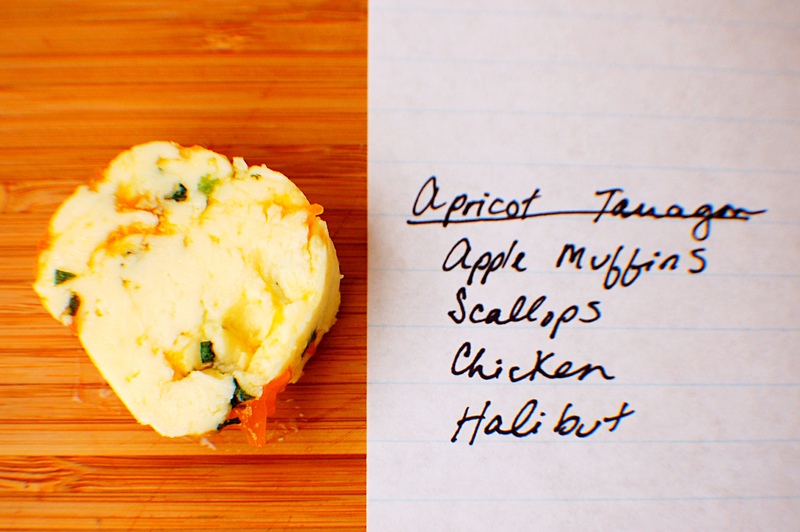 Uses: Top muffins or use as finishing sauces on scallops, chicken or halibut. In a saucepan, boil apricot slices, 1/3c water and 1tbs sugar until apricot dissolves. 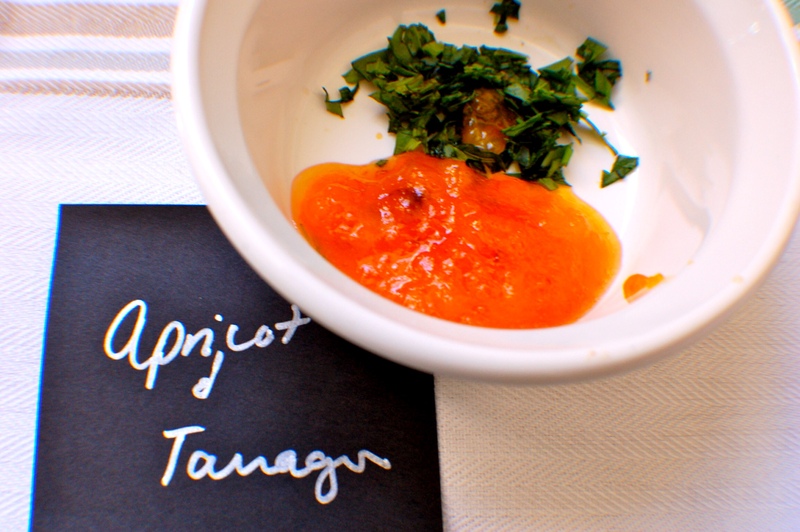 Let cool and mix with butter and minced tarragon. 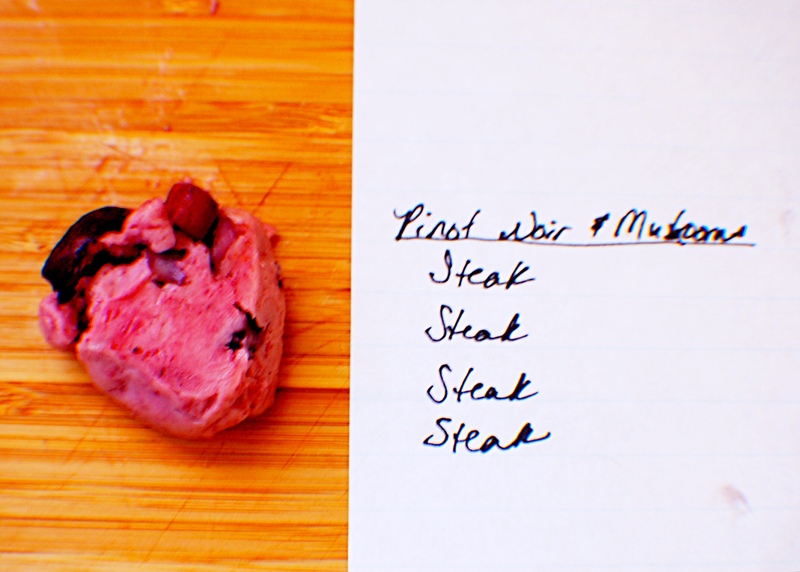 Uses: Steak, steak, steak, and steak. 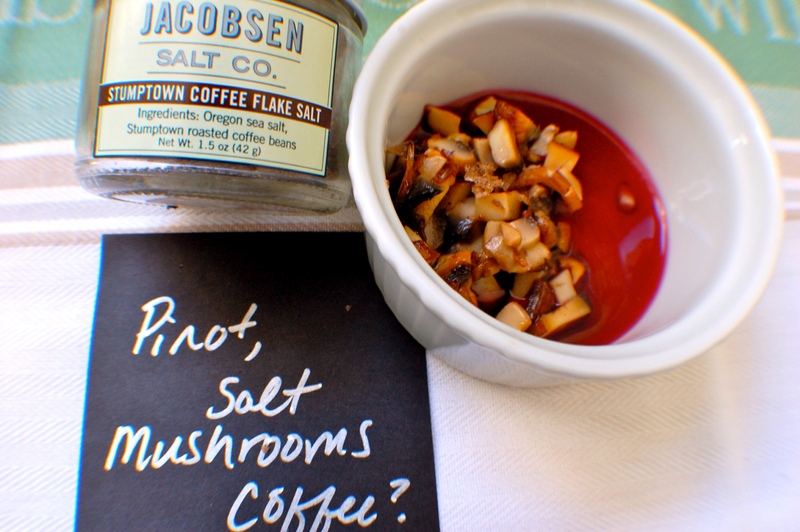 It’s not that you can’t use it on other things, but it’s just so good on steak that I never want to imagine those two apart Reduce pinot noir (a fancy way of saying bring wine to a boil then simmer until at least 1/2 the liquid is drained off), sauté mushrooms in butter. This butter will take you a while to mix because the waters in the wine do not want to play with the fats and oils in butter, but keep at it – they’ll eventually make friends. 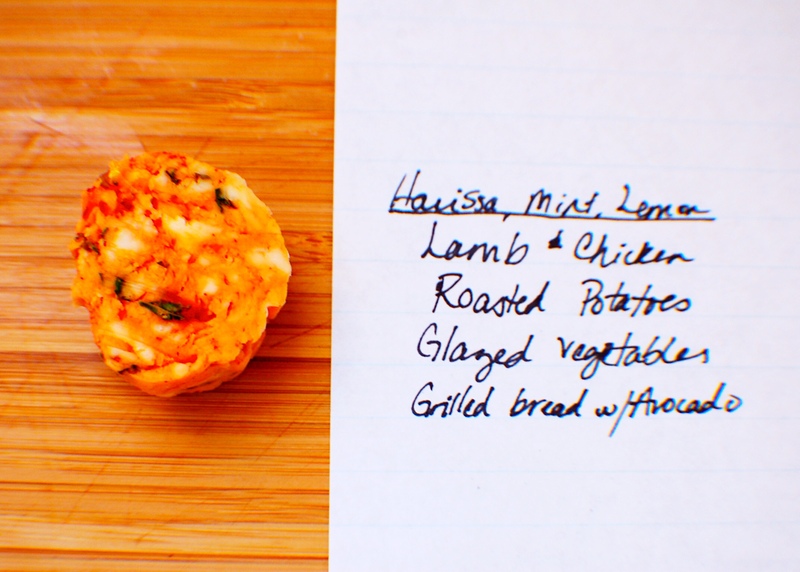 Uses: top scones, grilled bread, biscuits, or on roasted sweet potatoes. Recipe above. 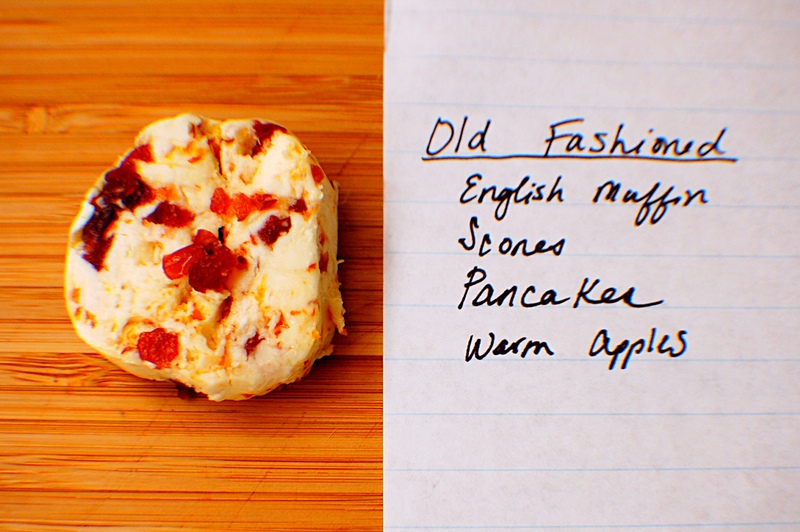 Uses: Top scones, toasted english muffins, pancakes or warm apples. BEFORE making butter, simmer 1/2 cup to a full cup (yes! this much!) bourbon in a saucepan until the alcohol burns off. You’ll know it’s burned off when you smell it and your nose does not do that “woaaaah that’s bourbon!” thing. Let cool and add to cream. Make butter as normal. 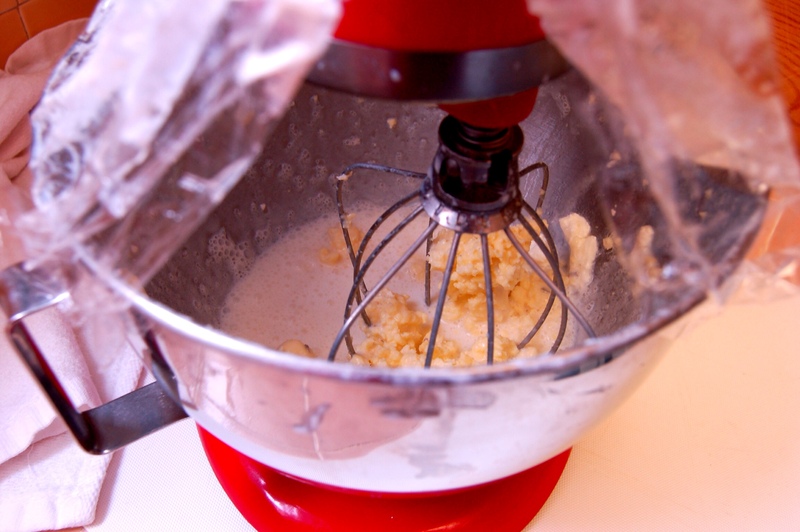 Note, because you’ve added a liquid, this is a little trickier to separate using a stand up mixer. I used a food processor, which separates the fats and liquids nicely. It requires more “washing” with ice water and has a different consistency. But it is SOOOOOO worth it. 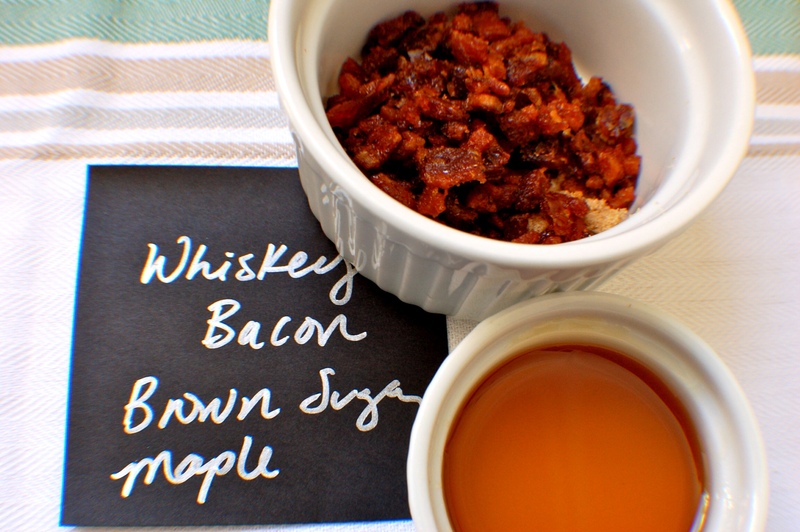 To make candied bacon, dice bacon, sprinkle with brown sugar and a little maple syrup. 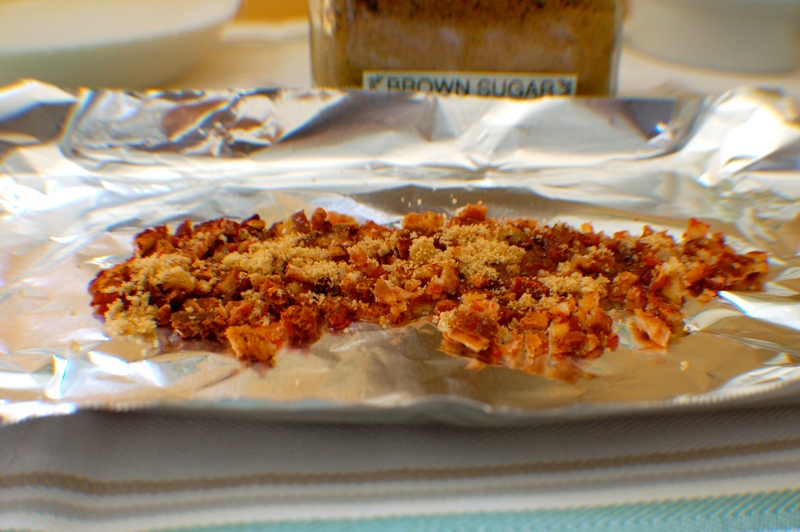 Place in a 350 degree oven for about 20 minutes until baked and crispy. Note, this will stick like hell to whatever you put it on so don’t put it on your favorite (or your mom’s favorite) pan. And don’t put it on aluminum foil like I did. It’s just a bacony, aluminumy mess. Tada! You have seven new butters with multiple uses for each one. Now it’s time to taste….and eat! What compound butters do you like? 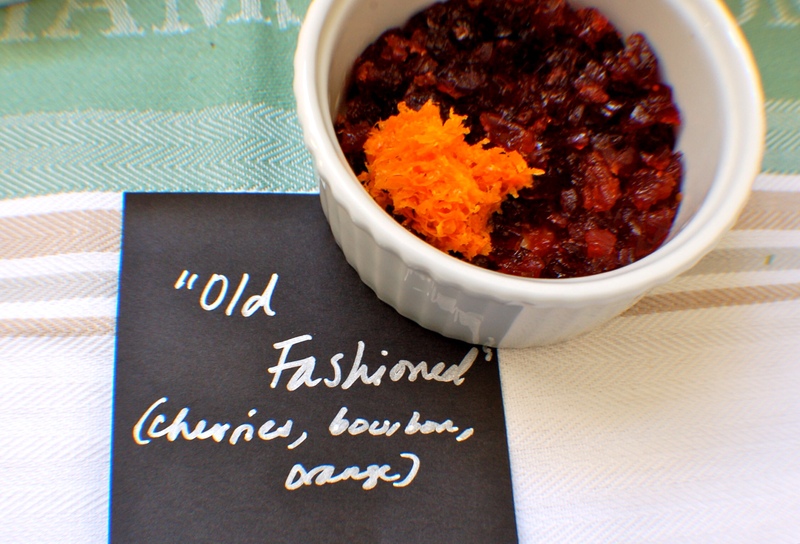 Leave comments and your recipes as well! 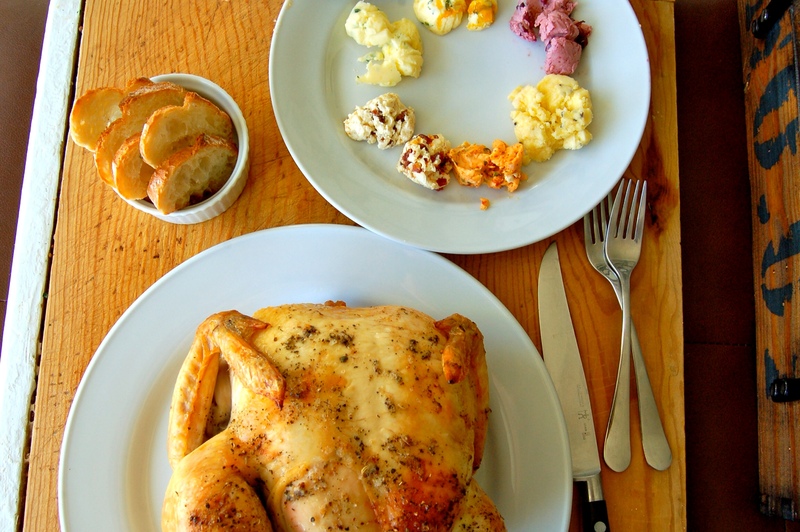 Special thanks to my friends, Rhianna and Bennet for letting me force-feed them butter on chicken and bread this week!